Raised at H.R.I. East Malling from a cross between Elsanta and Allstar. 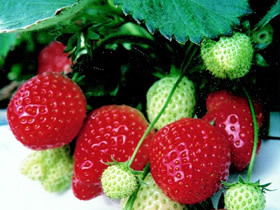 Eros is an alternative variety to Elsanta with a higher percentage of class 1 fruits, fewer mis-shapen berries, a higher yield potential and greater resistance to Red Core. The fruits have an attractive glossy skin with a good mid-red colour and are regular and conical in shape. Texture is similar to Elsanta and well flavoured.The plants are moderately vigorous with an erect and open habit that displays the fruit well. Eros has the advantage that the crown of the plant is more frost hardy in northern areas. A lovely new mid-season variety with heavy yields of exceptional quality fruit.